The Ford Fusion catches your eye with its unusual body proportions and raised chassis, and once inside you will be surprised by its unexpectedly spacious interior. 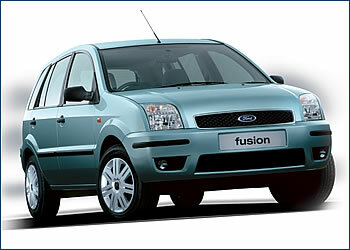 THE FUSION WAS conceived as a multi-purpose, compact car endowed with a self-confident design and a chassis with increased ground clearance and fifteen inch wheels. Thanks to its wheels and the strikingly shaped fenders, it almost looks like an SUV, but it has only front-wheel drive. Its modern chassis with a 2.49 meter wheel base and a transversely mounted engine up front and front-wheel drive are exactly what its mission calls for. 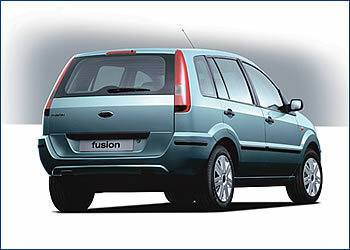 As a family car, the Fusion will travel mainly on highways and city roads. Its 4.02 meter-long, 1.72 meter-wide, and 1.53 meter-high, five-door body provides sufficient space for a family of four, and even with the standard seat arrangement it offers a relatively large, 337 liter luggage compartment. The rear seat, which is asymmetrically divided, allows gradual increases in luggage space up to 1,175 liters, and because the front passenger seat can be folded down (with the Trend options), it can carry items up to 2.3 meters long on the right side of the car. The Ford Fusion sells on the Czech market for CZK 379,900 with Ambiente options and a 1.4-liter, 80 hp (58 kW), gasoline engine, while the same version with a 1.4 liter TDCi, 68 hp (50 kW) turbodiesel engine goes for CZK 429,900. The better equipped Trend version (which comes with a 1.4 liter gasoline engine for CZK 414,900, or with a more powerful 1.6 liter, 100 hp (74 kW), four-cylinder gasoline engine for CZK 440,900, and with a 1.4 liter TDCi turbodiesel for CZK 464,900.